One of New England's largest lighting showrooms is moving it's Southington, CT store to a state-of-the-art 17,000 sf location just a few blocks up the road. The new showroom will feature the latest in modern lighting, ceiling fans, home automation products, decorative hardware and so much more! It's going to be a completely different concept than our Hartford, CT showroom. Everything will be floor displays, so there will be no walls put up. Connecticut Lighting Centers, family-owned and operated for 45 years, is moving its Southington, CT showroom down the road from its current location. In December 2017, the Queen Street showroom’s new address will be 50 Graham Place. The re-imagined lighting store will be double the size of the former showroom with even more inventory, from light fixtures, table and floor lamps to ceiling fans, decorative hardware, window shades, home automation products and home accessories. Similar to their main showroom in Hartford, CT the new Southington showroom will be virtually identical in size and vast product assortment. The larger space was designed with their valued customers in mind to enhance your shopping experience. The new location will make Connecticut Lighting Centers the best family of lighting showrooms in New England. With the latest and greatest ways to show beautiful, energy-savings products, consumers will be able to view of over 180 ceiling fans, 100 mirrors, home accents, window shades and thousands of light fixtures on display in a more open and welcoming space. The redesigned Southington store will also have a TV lounge for when your spouse is shopping, and you don’t want to miss the big game! 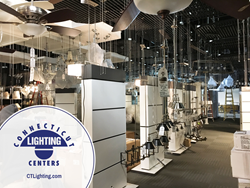 Conveniently located next to Pilgrim Furniture and Connecticut Appliance & Fireplace Distributors in Southington, CT the new Connecticut Lighting Centers showroom will offer a one-of-a-kind shopping experience, unmatched by any other lighting store in New England.